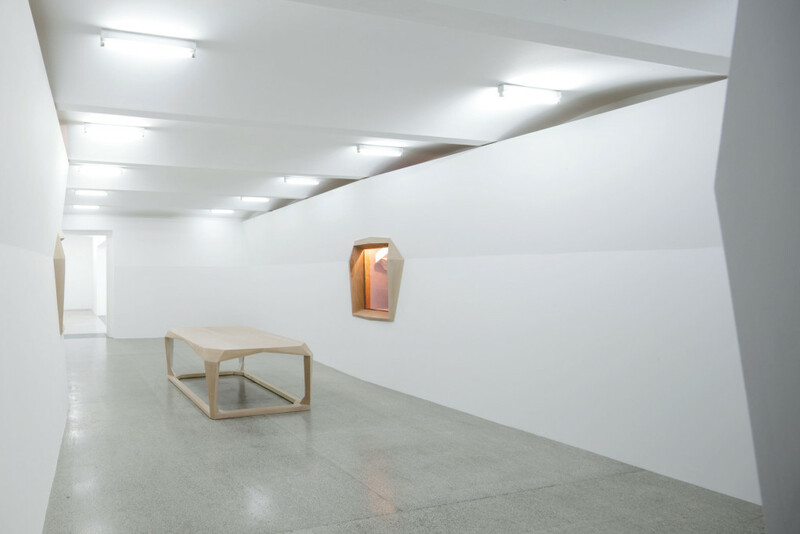 For his exhibition Expanded Anxiety in the Secession’s Galerie space, Czech artist Dominik Lang developed a series of works in which he reinterprets elements of Cubist sculpture and architecture. For the title installation in the back room, he reconstructs the famous statue Ùzkost [Anxiety] (1911/12) by sculptor Otto Gutfreund in an enlarged form specially adapted to the exhibition space, allowing visitors to experience the sculpture in a new way and get right inside it. In his interventions and installations, Lang explores the complex relations between viewer and object, object and space, subjective perception and historicization. He has repeatedly dealt with Czech modernism and demonstrated his personal approach to (art) history. The new vitrine architectures and sculptures on show in the first room are typical of the kind of free, fictional dialogue that he often sets up in his work with pieces by predecessors including Josef Gočár, Vlastislav Hofmann, Pavel Janák. At the same time, he also uses this presentation to create a broader context and to prepare the (historical) mood for his installation Expanded Anxiety in the back room of the Galerie. Lang has reproduced Gutfreund’s 156-cm-tall statue in an enlarged form that fills the exhibition space, presented lying on its side. 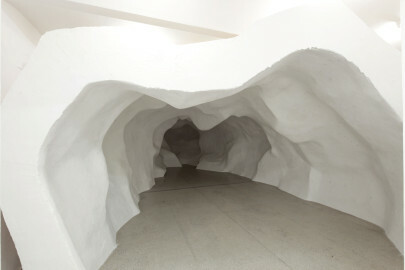 With respect to possible perceptions of the original sculpture, the artist creates a paradoxical situation: the monumental figure is positioned in such a way that although viewers can literally get right inside it, the “actual” outer form is not visible, accessible only to the imagination. In his catalog essay, Karel Císař describes Lang’s relationship with Gutfreund and his interpretative dialog with his work: “In Gutfreund’s ‘Anxiety’ this idea of a vertiginous dissolution of human personality seems only being approached – whereas Lang’s Expanded Anxiety is their belated consequential fulfillment. With the single viewing perspective of his smaller-than-life sculpture of a cowering woman, Gutfreund prescribed to the viewers a liminal proximity, making them inspect the edges of the figure submerging into the physical volume of the statue as if into a rock. 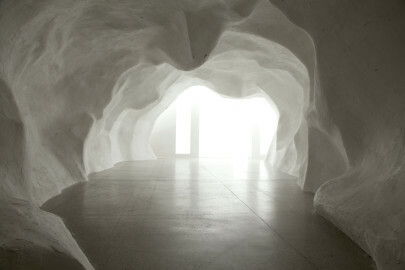 Lang, on the contrary, invites us into the innards of a disclosed body, metamorphosed into a corrugated cave, thus radicalizing Gutfreund’s effort to make sculpture flat – impossible to complete in a closed volume, as available to an early 20th-century sculptor – but also and primarily inducing the intended effect of vertigo and a loss of individuality, caused by the loss of optical control. Among others, Dominik Lang came to the attention of an international audience with his work Sleeping City in the pavilion of the Czech and Slovak Republics at the 54th Venice Biennale in 2011. 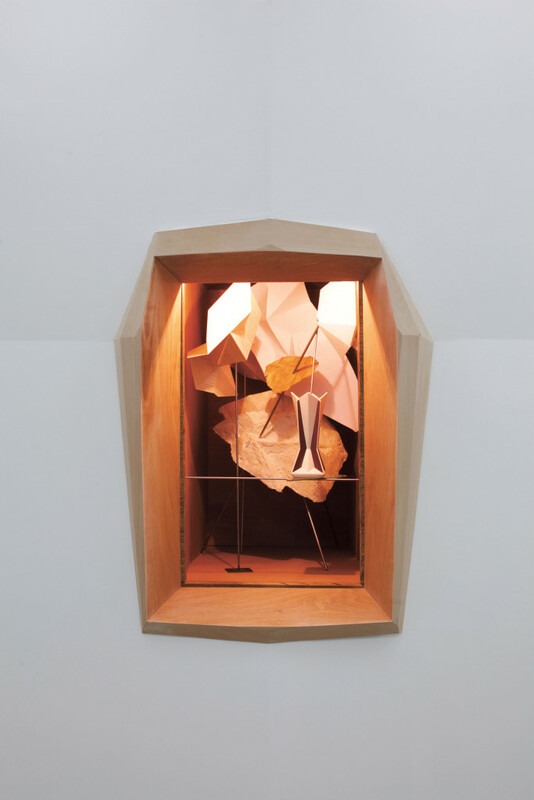 This installation, in which he interprets the unknown late-modernist sculptures of his father Jiři Lang (1927–1996), brings together two artistic approaches shaped by different periods and contexts. As well as enabling an encounter with a forgotten generation, it also underlines the immanent interplay between personal engagement and distanced observation, between individual and collective memory, as well as the impossibility of facing (one’s own) history. Dominik Lang, born in Prague in 1980, lives and works in Prague.